Blockchain Domains: 3 Benefits to Decentralizing the Internet1.72 billion people. That’s how many people are estimated to be affected by Internet censorship each day. Unfortunately, it’s only getting worse. According to pro-democracy think tank Freedom House, internet freedom across the globe is in steep decline, having consistently been on a downward trend for over six years now. For some, restricted Internet speech is an inconvenience, for others, a death sentence. Cue blockchain domains – a novel, censorship resistant, immutable, burgeoning asset class authorizing website and Internet permanence in a time of government overreach and curtailment. And, that’s not all. Censorship resistance isn’t the only way domains on the blockchain are bringing value to an otherwise highly censored and difficult to navigate online landscape, they’re also tackling on-chain cryptocurrency payments, exorbitant domain registration costs, and permissionless domain extension creation. Simply put, domains on the blockchain are our present day answer to several systemic failings plaguing the narrowly tailored, highly censored, centralized Internet and domain ecosystem of 2019. In this piece, we’re going to walk you through what blockchain domains are, three core benefits they provide, and one blockchain project leading the charge for Internet and website security and censorship resistance. Think of blockchain domains as your typical ‘.com’ and ‘.net’ domain extensions secured on the blockchain via smart contracts. Domains on the blockchain enable domain owners and registrants to take back previously waived proprietary and custodial online rights, as they’re free from government interference, ICANN extension restrictions, and censorship. 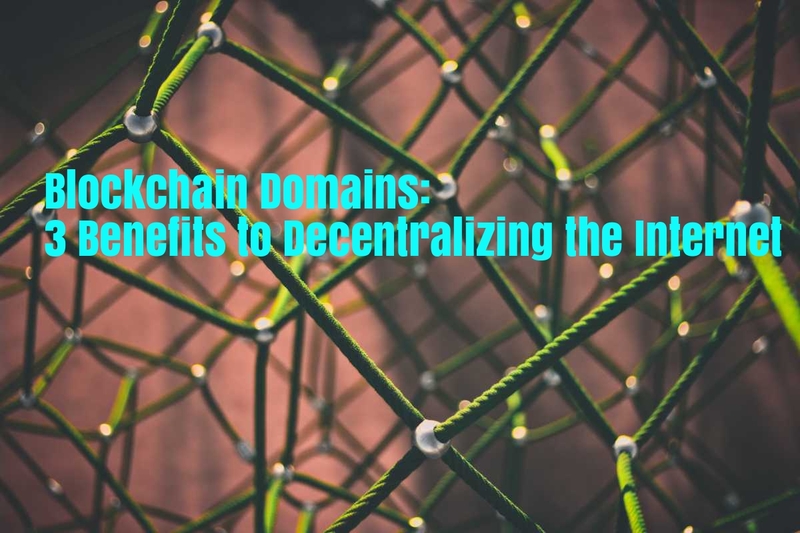 Most notably, domains on the blockchain utilize decentralized Domain Name System (DNS) services, where, instead of merely being leased a domain name, users now full own and control their domain. Let’s take a look at three core benefits blockchain domains provide to potential domain holders and users. As we noted above, government censorship is at an all-time high – with just over 25% of people countering at least one form of online censorship while using the Internet, and countless nation states even owning the ISPs which operate in their country. In the same way that crypto HODL’ers secure and store their cryptocurrencies, blockchain domains are also stored via crypto wallet. Remember, blockchain domains are simply assets on top of smart contract platforms, meaning the only way to gain access or control the domain is by way of private key. Traditional domains on the other hand, operate at the bequest and control of highly centralized registrars, such as GoDaddy, Bluehost, Namecheap, and HostGator, and can be easily seized, removed, or blocked. Furthermore, decentralized Domain Name Services sanction high degrees of user/owner privacy, as they don’t require the proferring of highly personal and identifiable information, which can subsequently be used by governments to track individuals and entities down in order to silence them. Authoritarian regimes and other governments looking to control the dissemination of content and information are now unable to do so, due to the storage of data across a peer-to-peer network and absence of central points of failure. Short for the ‘Internet Corporation for Assigned Names and Numbers’, ICANN is a nonprofit organization effectively in control of the Internet’s global DNS system and namespace/numerical databases. As the go-to international regulatory organization in charge of the global DNS system, ICANN is at the helm of new domain extension approvals – a slow-moving and costly process. As a result, individuals and entities looking to launch new extensions are often left in limbo, expending exorbitant resources for an uncertain online future. When it comes to domain extension approval, the issuance of blockchain domains is permissionless and knows no bounds, as domains on the blockchain are not subject to ICANN’s languid and costly approval process. Not only do domains on the blockchain allow for rapid deployment new domain names, enabling individuals and businesses to begin securing their online presence/content immediately, but they also won’t be putting you out of house and home just to secure one, as there’s no excessive third-party fees to be paid for registration. If you can dream it, you can create it as a name on the blockchain. How many times, when sending or receiving cryptocurrency, has a friend or family member asked you, “what’s your [insert cryptocurrency here] address?” You then furiously scramble and search throughout past transactions and blockchain explorers to locate your hexadecimal cryptocurrency address, which looks something like this; 04D2Z261F455866CE93FDAD1309AG4AC7C21L38E. Easy to remember? Not exactly. An unfathomable amount of cryptocurrency has been lost and forever burned due to the incorrect configuration of addresses when transacting. Look no further than this BTC user who sent over 2600 bitcoins to an improperly formatted BTC address, resulting in their irretrievable loss. Verifying one’s hexadecimal address when transacting in crypto can be a daunting and confusing task – especially for blockchain novices. Furthermore, crypto malware has proven historically effective in manipulating and changing destination wallets and addresses, resulting in ghastly sums being siphoned from unsuspecting users. Thanks to easy-to-remember and easy to use domains on the blockchain, sending crypto payments is as easy as typing in a web address. For example, if someone wanted to send me [insert cryptocurrency here], all they’d need to do is send it to my blockchain domain – ‘blockchainseo.zil’. Verifying recipient information and addresses is extremely straightforward with blockchain domains. The once wide margin of error associated with transacting in crypto has now been minimalized by way of easily human-readable addresses. Tackling an estimated USD $20 to 80 billion total domain asset class industry, Unstoppable Domains is a platform and gateway to the decentralized world of blockchain domains – replacing traditional hexadecimal cryptocurrency addresses with human readable names and securing the free-flow of information in immutable form. Via the Unstoppable Domains platform, users can purchase, transfer, and manage blockchain domains. And should one seek to cover all their bases in the land of online proprietary rights, Unstoppable Domains enables users to trademark a name through their platform to receive the .zil, .crypto, and all future blockchain domain names. Additionally, Unstoppable Domains provides a comprehensive suite of tools to make managing your blockchain domain a breeze, executing transactions on your behalf so you no longer need to expend gas to update them. You can test Unstoppable Domains out for yourself by heading on over to their website to set-up a testnet wallet, testnet ZIL, and blockchain domain name. Blockchain domains come at a time where technological advances are at their all-time peak, yet also at a time where our democratic channels are quickly eroding. Not only do blockchain domains offer a refuge for the free dissemination of information and censorship resistance, but also provide a novel way of transacting in today’s crypto-sphere. Interested in available blockchain domains? Head on over to UnstoppableDomains.com to check out their catalogue of .Zil domain names. Also make sure to follow their Twitter for the latest updates and announcements. Make sure to follow our blockchain blog for all the latest crypto updates, news, and informative articles. And, please do let us know any topics you’d like to see us cover this 2019. We’d love to hear from you!